1 What is Personal Science? 6.14 Are my Dialister levels normal? 8.2 How are you different? Microbiome experiments are complicated by the difficulty of holding everything constant. Even if you are careful with precise amounts of the same food and exercise, you are still dealing with your existing microbiome with all its uncertainties, making it difficult to tell precisely what caused a particular change. What if you could wipe the slate clean; start over with a completely new biome and just track that, along with precisely what you eat afterwards? What could you learn? 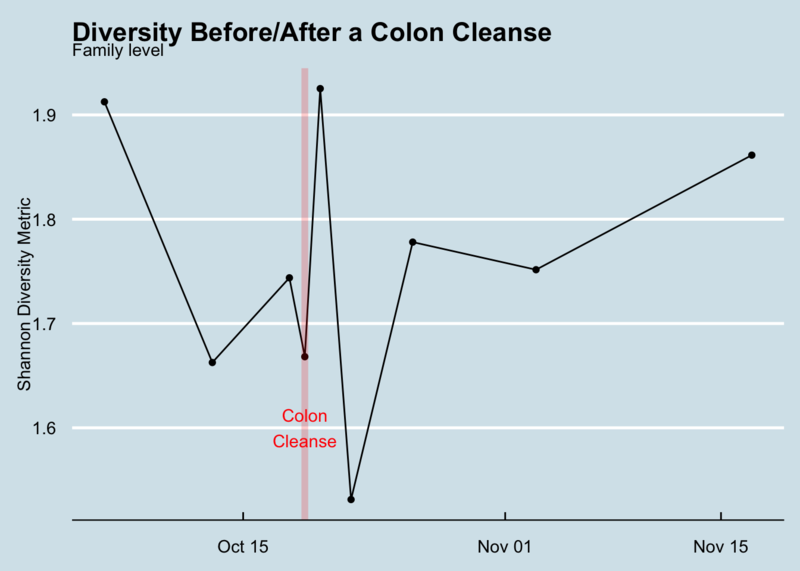 In this experiment, I tried exactly that, using a colon cleanse – the kind you do before a colonoscopy screening. By flushing all the bacteria from my system and carefully watching them grow back with day-to-day testing, I was able to get a better picture of the resilience of my microbiome. My gut microbiome recovers pretty quickly. Unlike antibiotics, which are known to cause long-term (and possibly permanent) changes, losing bacteria this way seems to matter only for a day or two. The missing microbes sprout right back just like a haircut. In two weeks it was as if nothing had happened. Figure 6.19 is a broad, phylum-level look at how the various microbes shifted in abundance. As you can see, all of these high-level colonies were back to the same proportions that had been before the cleanse. 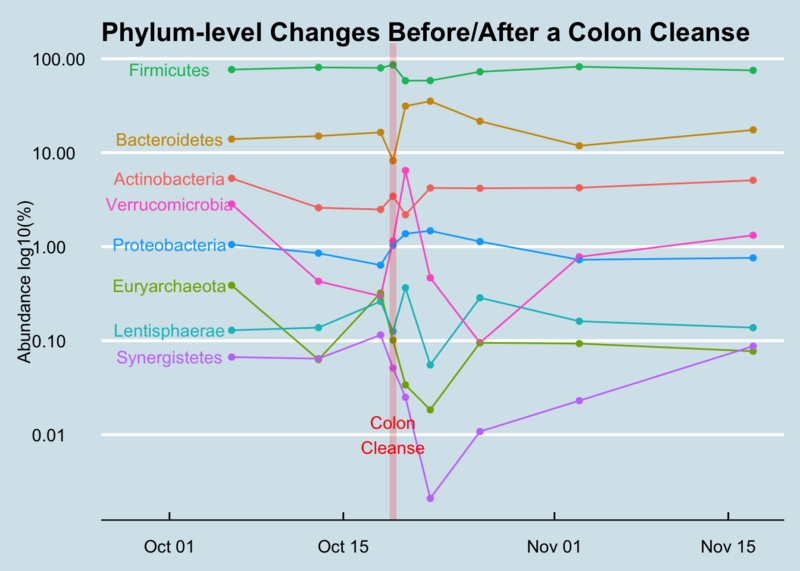 Figure 6.19: Overall phylum-level summary, from baseline (2 weeks before the cleanse) to CC (colon cleanse) to one month after CC. Even at the more detailed, genus-level, whatever shuffling occured didn’t look much different than the normal random variation I see in any month-long survey. 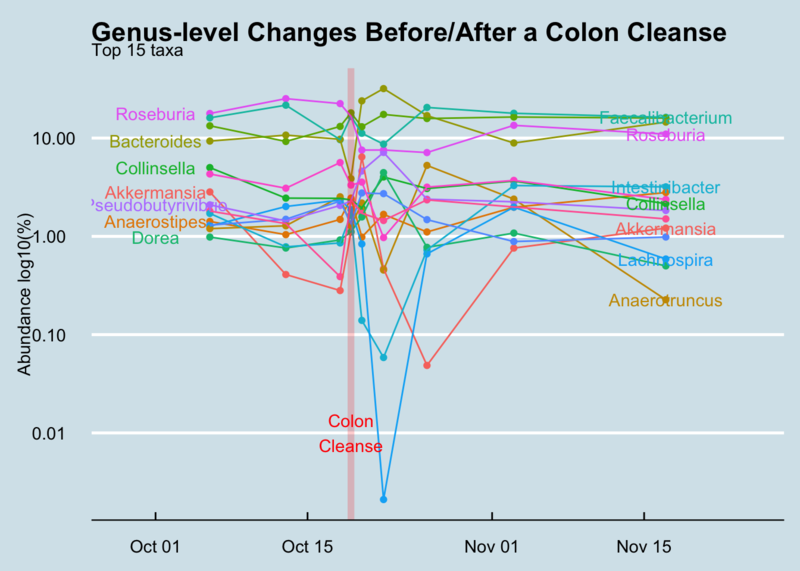 Figure 6.20: Overall Genus-level summary, from baseline (2 weeks before the cleanse) to CC (colon cleanse) to one month after CC. Amounts and ratios changed, but not the specific organisms. Of course I lost a bunch of bacteria – that was the point – but surprisingly I didn’t seem to gain anything really new, even after an aggressive attempt at re-seeding. I didn’t gain or lose a single phyla. Other than amounts and ratios, I had to dig down to the Class level of the biological hierarchy to find anything that was permanently lost, and even at the very fine-grained Genus level, only two taxa that had been regularly present beforehand were now extinct. (Holdemania and Methanomassiliicoccus). Figure 6.21: Shannon level diversity measures before and after the cleanse period. A couple of weird microbers, at small amounts, made a brief appearance. I was intrigued by five new taxa that showed up just once, the day after the cleanse, and then disappeared. Maybe I found some that ordinarily get lost in the noise of the microbiome and only show up when the rest of the forest has been cleared. These are some hardy guys and I’m glad I know their names and can watch for them again: Abiotrophia, Bacillus, Catonella, Christensenella, Parvimonas. It’s pretty hard to make a significant change. These days a little googling will find plenty of web sites, books, diets, and supplements that claim to “fix” or “change” your microbiome. I’m a healthy, reasonably fit adult, so I’m not as motivated as somebody with a specific health problem, but I thought simply popping probiotics and eating a variety of new and fermented foods would have a big effect. Nope. There are exceptions – new microbes will sprout when I drink homemade Kefir, or travel to China but it’s much harder than you’d think. 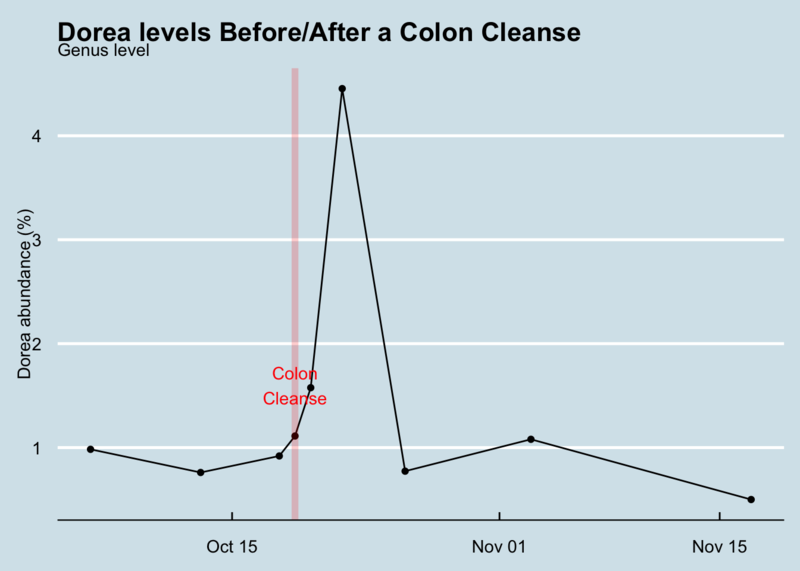 Figure 6.22: A rise in Dorea after a colon cleanse. A more recent Japanese experiment Nagata et al. (2019)83 also found, like me, almost no difference after two weeks. They also used a mass spectrometer to study the specific metabolites present in each sample, but again, after two weeks it’s as though nothing had happened. When I began this experiment I thought for sure I’d find something unusual and perhaps uncover a new way to modify the microbiome. Ultimately the main thing I learned is that the microbiome is incredibly robust. Even a complete reset won’t change much. Nagata, Naoyoshi, Mari Tohya, Shinji Fukuda, Wataru Suda, Suguru Nishijima, Fumihiko Takeuchi, Mitsuru Ohsugi, et al. 2019. “Effects of Bowel Preparation on the Human Gut Microbiome and Metabolome.” Scientific Reports 9 (1): 4042. doi:10.1038/s41598-019-40182-9.